One of the biggest discouragement that comes to a believers heart and makes him an ineffective testimony for Jesus is doubt and worries. Doubts are satanic weapons that makes a believer to destroy himself like the first Adam doubted the word of God and plunged the whole of humanity in to sin, suffering and death (Rom 5:12). The worst form of doubt is when a believer begins to doubt about his own salvation that he has received already, and becomes unsure of whether he is saved as God has already promised him (1 John 3:20-21). This comes because they are not grounded in the word of God which assures our heart of the permanency of salvation (Rom 5:10). A believer will start to doubt about his own salvation usually when they begin to fall in to besetting sins, fail to forgive and forget their own mistakes, forgive others of their tresspasses done against them, are ignorant of the words and promises of God to finally get discouraged and live a defeated lives. This doubt about salvation arises when a believer becomes too conscious of his own behaviour than his belief in the word of God and the glory of God (1 Cor 10:31). One thing we must always remember from the day we are saved until the day we will die to appear before God, we are not saved by our good behaviour but by our belief that Jesus died by shedding his precious blood for us and have thus done something that we could not do for ourselves, to save us from sin and death (Eph 2:8-9). Many of us start with grace but slip in to legalism like the Galatian believers who were rebuked strongly by Paul the apostle (Gal 3:1-3). God has saved us first of all through Jesus to help us receive the abundant life of heaven and live like Jesus did when He was on earth (John 10:10). We were never created to perform a function just like robots for God. God gave us free will to help us understand that he loves us unconditionally and so that we might choose to live for Him and love Him without any fear of punishment for our sins and shortcomings (1 John 4:17-19). Those who love God voluntarily and choose to live for Him out of that sincerity can only really bring joy in to the heart of God. There are two types of fear that makes people live for God, one is the fear that God might hurt them if they fail to obey Him and the other is that they might cause God's heart to become hurt. Only the second type of fear is what is healthy and godly. The true fear of God is not the one that comes because of the fear of punishment but that which comes out of a passion, respect and an awe for God's glory! God is never delighted when some one restrains himself from doing bad things because of fear of punishment. A person can remain faithful to his wife to avoid getting HIV virus, still another person can give to God to gain his blessings from him, still more another person can avoid anger to make other people think that they are gentle person and finally a person can keep the commandments to gain eternal life. All these above reasons are good and selfish reasons enough for us to keep ourselves safe and comfortable, but they do not keep us in true holiness that comes from God. We may do these things thinking that we are godly person, but none of it can make us a ounce more godly because without love all we do is unacceptable to God (1 Cor 13:1-3). It is like taking a pig chained with all the chains in the middle of the road with all the unclean stuffs lying on both sides. Just because the pig crosses the whole dirty place without eating or rolling itself in the smelly unclean stuffs, it cannot make the pig boast that it had achieved greatness and holiness. In the same way, when we live a holy life for selfish reasons, God will not be pleased with our so called spirituality. If we love God for no reason but for His unconditional love, God will be delighted with our lives (Psa 147:11). God is love and this is the reason when He saved us through Jesus, he did not want to make us His servants but His children (1 John 4:8; John 1:12). Once we accept ourselves as a sinner and receive Jesus Christ in to our hearts as our Lord and Saviour, then God puts the seal of the Holy Spirit as a gurantee that we are saved until the day of rapture of all saints (Eph 1:13-14). Not even one apostle ever spoke or warned about God unsealing any believer based on their behaviour. We as sinners are saved eternally because in our best spiritual form we cannot keep ourselves to the perfect standard of God's holiness (Heb 5:9; Rom 3:23). We cannot boast even for an hour or more to keep ourselves in His perfection and restrain ourselves from sinful thoughts, motives, words and actions that defile us constantly without the help of God (Mark 7:20-23; 2 Cor 2:14). As a sinner adopted to be a child of God, God knows the kind of inhibition we will have in calling God as our Father freely. 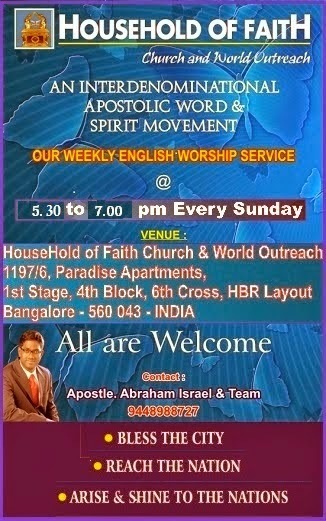 Because we still live in the physical body of sin in which sin nature still operates to a lower or higher degree according to our spiritual maturity and will continue to do so until we die in someway or the other (Rom 8:16-17), God has sent "the Spirit of adoption" by whose help we start to cry out to God as "Abba, Father." (Rom 8:15). In other words, once we are adopted as God's sons in to His spiritual family, we are forever trasferred from "darkness to light", "Power of Satan to God" and we who were "dead in trespasses and sins" "He [has] made alive" to be "the light of the world" (Acts 26:18; Eph 2:1; Matt 5:14). This cements our relationship with God as the member of His spiritual family for eternity ahead. So there are two aspects to our spiritual relationship with God. 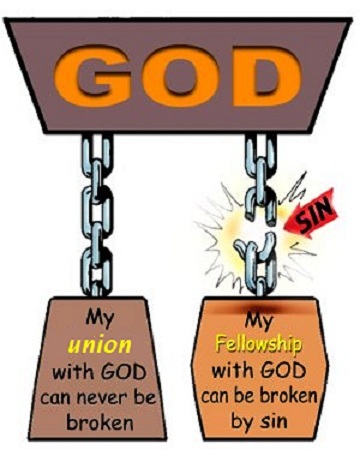 One is union with God which we attain the moment we become His child and the other is fellowship with God which needs to be maintained through living a life pleasing to Him. 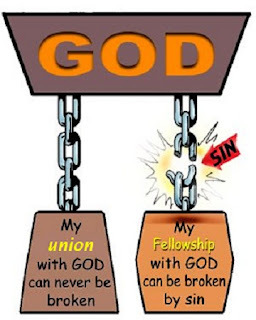 This union is a supernatural infusion in to God's kindom as His beloved children by His power. 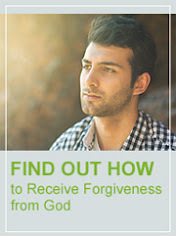 But the fellowship with God is a choice that we make each time we sin consciously, whether to confess and be cleaned by the blood of Jesus immediately for the relationship with God to continue in the same way as before, or to remain unconfessed and to keep ourselves severed from the consciousness of God's presence in our soul. Just like a earthly Father who pities and forgives his children once they confess their faults to them, our Heavenly Father also forgives and forgets all our faults, weaknesses and sins once we choose to confess to Him with a penitent heart. Our God removes all our breaking of His law and throws away our sins as far east is from the west (Psa 103:13, 12). Why east from the west? Because east and west never meets. In other words, to a immeasurable distance he throws all our sin garbage once we confess it to Him and cleanses it completely (1 John 1:7, 9). A restoration of fellowship takes place once this confession of sins takes place. The consciousness of God's presence to our soul will be restored at the moment confession to God is done. When Jesus said, "27 My sheep hear my voice, and I know them, and they follow me: 28 And I give unto them eternal life; and they shall never perish, neither shall any man pluck them out of my hand. 29 My Father, which gave them me, is greater than all; and no man is able to pluck them out of my Father's hand." (John 10:27-29), he was speaking about the believer's new life of God received in their spirit-man that can never be destroyed or altered. The children do not plan their birth, but instead the father of the family plans it and executes it. In the same way we did not get saved by our own choice but by the choice of our Father in Heaven (John 1:13). Before our Father in heaven planned us to be born in to His spiritual family, he fully knew well that we are weak and are susceptible to sin. But inspite of all our shortcomings and our tendency to hurt Him many times, He chose to love us. If we think we were saved by our love towards Him because He is good, we are in for a surprise. He loved us first when we were enemies in sin, then He gave us His nature to transform us from the inside out (1 John 4:19). We cannot do anything great for God because we have no goodness in us except that which He has given us. Only we do something great through God because we have become His children. Many who think that by their strentgth they found God, soon find the perversion of evil that comes out of them constantly and end up becoming discouraged and even act hypocritically as a good person in order to maintain their so called reputation before people. We must understand that God did not send Jesus to make the bad people to become good, but to raise the dead people by infusing the life of God within them supernaturally. We cannot be better than what we are positionally already, in our relationship with our Daddy God. But out of our gratitude towards Daddy God for having made us to be His child, we can work with God by sacrificing our body as a living sacrifice and get transformed by renewing our mind constantly (Rom 12:1-2). A life of thankfullness for our salvation is the great offering we can offer to God for having sent His only begotten Son Jesus to die for us and as a result make us acceptable to Him as His beloved child of His love (Eph 1:6; Col 1:13; Rom 8:37). Our heavenly Father loved us in the same way He loved Jesus for the eternity past, He has also promised to love us for eternity future in the same way (John 17:23). The true love of our heavenly Father will never fail to forgive us. It is love that covers our sins and not just our repentance (Prov 10:12). We cannot lose our salvation because Jesus lost His sinless life for our sake so that Father God's Perfect requirement of His justice be fullfilled for our sake. If ever after believing the salvation of the Lord, we could lose our salvation because of our lack of righteous performance, it again becomes a work based salvation which cannot be called as something given to us as a gift because of the unconditional love of God. But as some people say, if our Heavenly Father changes His heart seeing our ungratefulness and sinful inclinations, and takes away our salvation away from us, first of all it means, it must have been a conditional covenant from God and that God Himself in His omniscience have failed to see that we are corrupted by sin nature until death and are worthless to ever live in His perfect righteousness. But not even in one place in the Bible, the apostles ever supported this kind of statement even with a sligtest hint. Instead again and again they said that we are not evaluated by God based on our behaviour but only based on our belief in the promises of God fullfilled through Jesus. Paul the apostle wrote, "29 For whom He foreknew, He also predestined to be conformed to the image of His Son, that He might be the firstborn among many brethren. 30 Moreover whom He predestined, these He also called; whom He called, these He also justified; and whom He justified, these He also glorified. 31 What then shall we say to these things? If God is for us, who can be against us? 32 He who did not spare His own Son, but delivered Him up for us all, how shall He not with Him also freely give us all things? 33 Who shall bring a charge against God’s elect? It is God who justifies. 34 Who is he who condemns? It is Christ who died, and furthermore is also risen, who is even at the right hand of God, who also makes intercession for us. 35 Who shall separate us from the love of Christ? Shall tribulation, or distress, or persecution, or famine, or nakedness, or peril, or sword?" (Rom 8:29-35). In the preceding verses, Paul clearly emphasizes that God did not make a mistake in selecting worthless sinners like us to be chosen to become in the perfect image of His Son Jesus Christ. God made all the saints to be saved by making their sins to be wiped off forever and thus were made clean as if they had never sinned at all through Jesus (Rom 5:9-10). Then God always gives His strength progressively to overcome our sin nature through strenthening the inner spirit-man with the might of Jesus Christ inorder to be glorified (Eph 3:16). We grow more and more in the love of God, and become grounded in the love of God through this life long process of being strengthened to overcome sin and weaknesses of the flesh. Just because we go through this painful process of transformation, should not make us think that we could lose our salvation. Through the times of transformation, we will feel the lose of God's Presence many times in our soul because of sin, unbelief, trials and intense tribulations. These are called by saints of the past ages as the dark nights of the soul, where the enemy of our soul will make us question our very salvation. This is the reason Paul asks the question, "Who shall separate us from the love of Christ?". The answer is, no one on earth, in heaven or under the earth, can be able to seperate us from the love of God. Not even our failures, weaknesses and backslidings can seperate us from the love of Christ's unconditional love. The true love of our Father in heaven is expressed personally to us through Jesus, from the time we have received Him as our Lord and Saviour, we are forever sealed in His love unto eternal life through His Spirit (John 14:9-10; 2 Cor 1:22). It is God's desire that we grow in His love and feel secure in it (1 John 4:18). If we are asked to do just one thing in Christian life, it should be forgetting of our own inadequacies of our life and be willing to run in the strength of the love of Christ which can never fail to empower us to fulfill the call of God that God has pre-planned for each one of us to fulfill (Phil 3:13-14; 2 Cor 5:14). May the love of God ground us deep and make us become rooted in His faithfullness so that we may stop to fear about losing our salvation and start to live for God the rest of our lives as a gratitude and thankfullness for all the things He has done for us. In Jesus name. Amen!